Mount Mobius is asserted to be the highest summit in Sonic's world; a titanic volcano rising up out of the sea and being generally intimidating to nearby observers. The mountain disapears at the end of Sonic Spinball when it, along with the Veg-O-Fortress sinks beneath the waves. What Mt. Mobius looked like in its pristine, natural state is never shown, for the mountain makes its first appearence only after the Veg-O-Fortress is built on it by Doctor Robotnik. 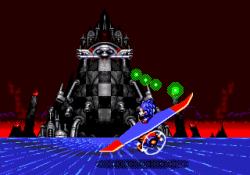 In the style of evil geniuses everywhere, Robotnik decides that the highest point in the world would provide an excellent site for another of his evil bases; and the locale is all the more attractive due to the fact that Mount Mobius' furious volcanism will provide ample electricity for his deranged schemes. Toxic Caves (Toxic Pools in some versions): Sonic is flushed into a stinky cavern full of toxic sludge and mine carts, which just so happens to be the place where Robotnik dumps all of the industrial waste. Lava Powerhouse: Sonic ascends to the next level, a power station of sorts that uses magma and steam energy to run various machines. The Machine: At the industrial heart of the Veg-O-Fortress lies an immense, automated badnik production plant, complete with mass-robotizer and a central prison for those animal friends yet to be 'processed'. The Showdown: A launch pad at the summit of the mountain, where Robotnik attempts to escape aboard his spaceship. After pretty much everything inside the Veg-O-Fortress gets wrecked during the events of Sonic Spinball, Robotnik's facility collapses. The end sequence of the game shows Mt. Mobius and the remnants of the Veg-O-Fortress falling beneath the waves. Consequently, the mountain is destroyed. This page was last edited on 24 January 2018, at 22:09.